Lady Margaret Boat Club’s M1 (LMBC) and Jesus College Boat Club’s W1 remained at the head of the river in the men’s and women’s divisions respectively as a frenetic May Bumps came to a conclusion on Saturday. This achievement reflects their form all season long, because both crews also finished at the top of the Lent Bumps table. Despite promising showings from Pembroke in the men’s division and Newnham in the women’s division, in the end neither headship was seriously threatened, as LMBC and Jesus rowed over comfortably at the top in all four races. Pembroke bumped Caius and then Clare to start Saturday in second position, but were then rebumped as Clare finished the week where they had started, behind LMBC in second place. In the women’s division, Newnham bumped Caius and Emmanuel to climb to second, but rowed over on Friday and Saturday without seriously challenging Jesus. Behind them, Magdalene bumped four times to finish fifth in the men’s division, bumping Downing on the final day. Emmanuel finished level in seventh, while First and Third rose two places to eighth. In the women’s division, there were no bumps in the top half of the first division after Thursday, as Downing, Caius, Clare, LMBC, and Girton all rowed over twice. Three other first boats, Clare Hall M1, Trinity Hall M1, and Wolfson W1, achieved their blades by bumping up on all four occasions. The Pegasus Cup, awarded for the best overall performance by a college, went to Wolfson, whose four boats gained an aggregate total of 14 positions, celebrating 50th anniversary of their boat club in style. It was a bumps to forget for Peterhouse and Murray Edwards, who both saw every one of their crews bumped down every day. In the lower divisions, where the quality of rowing can vary substantially, this bumps will be remembered for two remarkable overbumps. On Wednesday, Wolfson M2 achieved a double overbump on Girton M2 to gain five places in a single day, and finished the week up eight by bumping Corpus Christi M2, First and Third M3, and Selwyn M2. Not to be outdone, Magdalene College M4, who started the week at the foot of the river, achieved a quadruple overbump on Thursday on LMBC M4. The quadruple overbump was the first since Peterhouse W1 in 1986, and only the second in the 131-year history of bumps. Safety once again was a concern this year, and on Wednesday the M5, W4, and M4 divisions were all stopped because of carnage on the river. Two coxes were banned from bumps for collisions with a stationary crew. 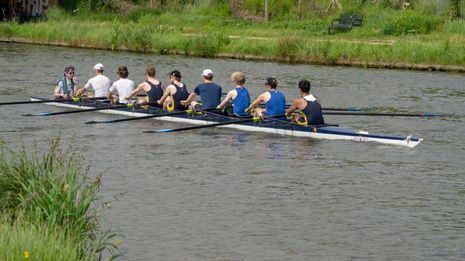 On Wednesday, Anglia Ruskin M1 rowed into crews trying to clear the river in the Gut, the narrowest part of the course, while on Friday, Pembroke W4, pursuing Trinity Hall W3, collided with a crew that had bumped out on the exit of Grassy Corner, hospitalising a rower who was hit with a blade. In both cases, the offending crews were penalised by a bump being awarded against them, and hit with a £75 fine.